A thing of beauty: A multi-modal street in downtown San Jose serving light rail and buses in exclusive lanes, as well as private automobiles. Photo by C. Rubin. One of our goals at The Source is to give attention to novel transportation ideas found elsewhere — whether it’s innovate ways to finance transit projects or finding better ways to share bus schedules with the public. With that in mind, we turn our attention to a transit pass program run by the Valley Transit Authority (VTA), the public agency that serves the San Jose metropolitan area with 75 different bus routes and 42.2 miles of light rail service. It’s called the Residential Eco Pass, and it offers deeply discounted annual transit passes to residential communities. To get the inside scoop — its genesis, successes, and challenges — I recently spoke with three officials at VTA who have worked closely on the program: Chief of External Affairs Greta Helm, Sales and Promotions Supervisor Dino Guevarra and Deputy Director of Accounting Ali Hudda. Implemented a decade ago, the residential program was designed to mimic VTA’s successful employer-based Eco Pass program, which is designed to make it easy for workers to get transit passes through their employers and has been adopted by several of the region’s major companies such as Yahoo! and Lockheed Martin. The overarching goal of the residential program is to get transit passes into as many people’s hands as possible — i.e. to provide a cheap and easy way for San Joseans to try public transit and see how it can enhance their travel around the region. To obtain a Residential Eco Pass, a so-called housing community — a homeowners association or residents of an apartment or condo building — must agree to buy an annual transit pass for every resident over the age of five. 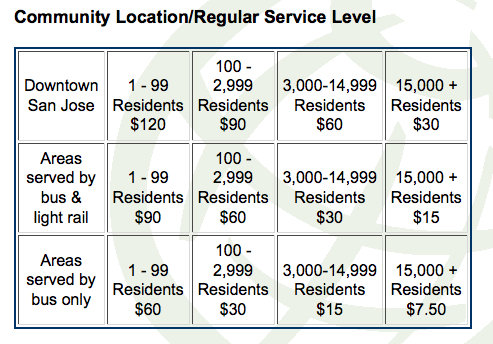 According to Gueverra, the Residential Eco Pass is most often treated as a community amenity and the cost is absorbed into the price of rent or homeowners dues. Given that a normal monthly pass costs $70 for basic services and $140 for an “Express Pass,” the savings for Residential Eco Pass users can be enormous if they take full advantage of their passes. But there’s a rub. Because riders with an Eco Pass riders only need to flash their designated card to board a bus or train, the agency lacks a rigorous way to know how often and in what manner the passes are being used. According to Deputy Director Hudda, this presents two key challenges. First, the project was intended to be revenue neutral — in other words, it shouldn’t add any new costs to the agency. To achieve this, VTA tried to price the program such that, on average, each trip made with an Eco Pass is comparable to one with a standard fare — which suggests that many pass holders don’t use the pass very often. Without a smart card type technology, the agency doesn’t really know how much benefit is provided by the residential Eco Pass, or if they’re hitting their revenue targets. Second, not knowing how or when travelers are using their Eco Pass limits the VTA’s ability to tweak service to most benefit transit riders over the long haul. The Clipper Card launched in the spring of 2010. San Jose will shortly be joining a regional fare initiative called the Clipper Card for the entire Bay Area, much like the TAPprogram in L.A. County. When fully rolled out, the smart cards will allow people riding transit to store various fares and a cash purse for use on over twenty transit agencies in the Bay Area. In the long run, this system could help VTA better track use of its Residential Eco Pass program. But, as Mr. Hudda points out, the two programs operate on very different platforms and rationalizing the two presents a “serious logistical challenge” that the agency wouldn’t even attempt until it has the Clipper Card program in place and all the kinks worked out. Could such a program work in Los Angeles County? It’s easy to see how it could have a huge impact in Los Angeles. Just imagine if Metro could get a discounted yearly pass into the hands of every resident of Park La Brea and its 4,000 units — it would certainly be both an incentive and make it easier for residents to take transit instead of driving. I asked the three VTA representatives what recommendations they would make to another agency based on their experiences. The big one was to implement a system that would allow the agency to measure and understand how people are taking advantage of the program. Otherwise, there’s no way to determine if the agency’s policy goals are being met, i.e. to increase overall ridership, increase number of first-time transit riders and remain revenue neutral. That last one is important. And that’s the challenge: how to get passes into as many hands as possible while keeping a fare system that is fair to everyone who uses the system. Although it may be easy to say costs aren’t important, consider this: Metro and most other large transit agencies already subsidize a healthy chunk of each fare and questions remain how far those subsidies can go while preserving service. Great article, it’s nice to hear about alternative transportation systems. Come on, LA! Get up to speed! San Jose has 42 miles of light rail ?! Wow. Judging by the photo, they don’t mind taking car lanes away, either. I was really impressed with the way San Jose integrated light rail into their downtown at street level. The streetscapes felt very safe, accessible, and inviting. I should note that the 42 miles of light rail might sound like a bit more than it is, because it mostly connects bedroom communities to the city center, and is more like a hybrid Metro Rail/Metrolink. @Kelly Stevens, that 42 miles of light rail produces less ridership throughout Santa Clara County than our Gold Line alone.